TEMPE, Ariz. -- Dave Zastudil has quietly become one of the league’s top punters and that hasn’t gone unnoticed. After another day of controlling field position with his left foot, Zastudil was named Punter of the Week by ESPN Stats & Information. He had kicks of 48, 56, 55 and 40 yards, the last of which pinned the Carolina Panthers on their own 6 in the fourth quarter. 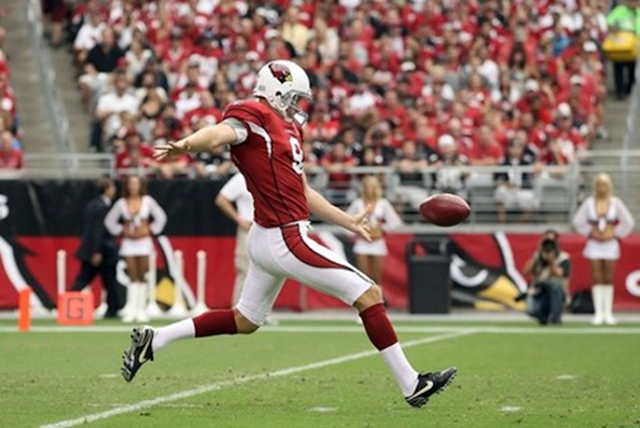 Zastudil, who set the NFL record in 2012 for punts inside the 20, is in another close race this season. He leads the league with 16, one ahead of Kansas City’s Dustin Colquitt and two ahead of Houston’s Shane Lechler. Zastudil, with the help of Bethel, didn’t allow the dynamic Ted Ginn Jr. to hurt the Cardinals. Ginn had just one return for six yards. “Justin made a great tackle there,” Arians said. “They had a field return on and Dave really did outkick the coverage other than Justin, but he pinned him and made him move and Justin made a great play.